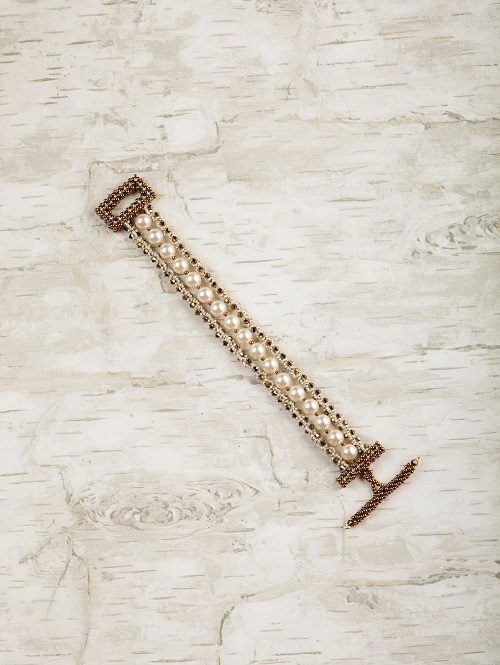 If you think little seed beads cannot emulate the look of precious metals, think again! 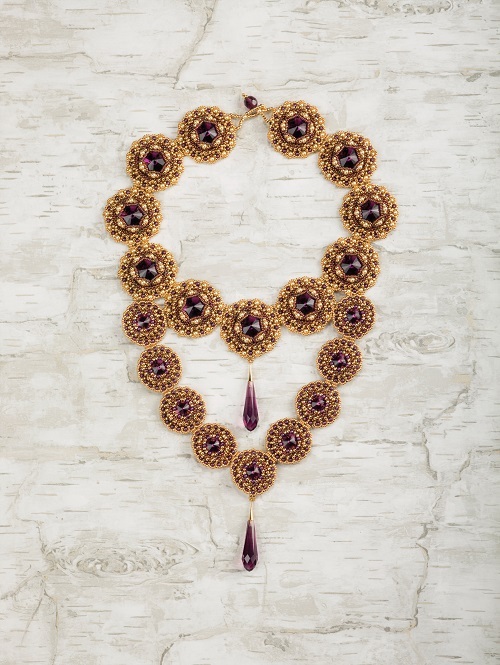 It always amazes me how small beads well put together can attain the look of luxury. Such beautiful will have its admirers! 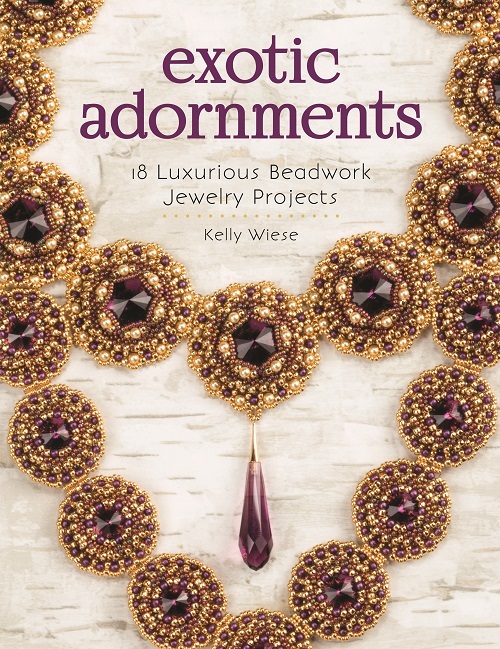 If you love beadwork and luscious designs, then you might well be interested in this book by Kelly Wiese - Exotic Adornments: 18 Luxurious Beadwork Jewelry Projects . I recently received it from Interweave for review. The bulk of the designs are necklaces and bracelets. But there is one ring and 3 earrings designs. This book is not for beginners. It is best suited to intermediate and advanced beaders. That's because, you do need to know a whole range of beadweaving stitches - RAW and cRAW, flat even count and circular peyote, flat and circular herringbone, circular netting, bead embroidery as well as the basic brick and ladder stitches. 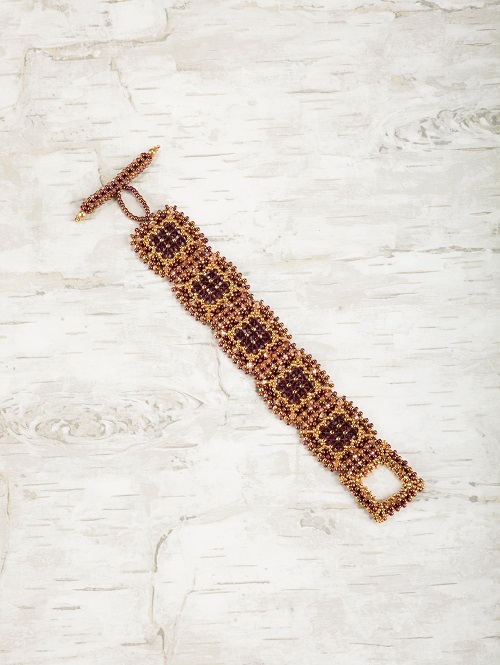 The mainstay of the projects are metallic Japanese seed beads. The majority of the designs look spectacular done in gold but there are a few done in silver tone beads. Some of the designs are quite elaborate - the designer was inspired by Bollywood! But others are simpler in style. 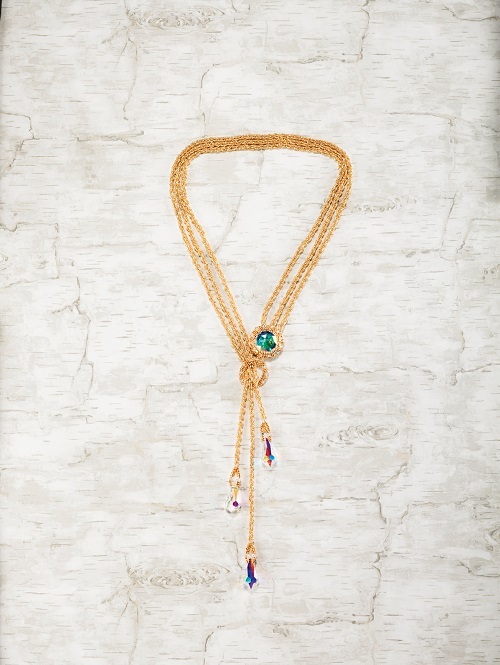 The lariat necklace above as well as the Swag necklace at the end, shows how the designer cleverly imitates gold chain. One of the my favorite designs was the Mixed Metal Cuff one shown below. An outstanding design which deserved its name. 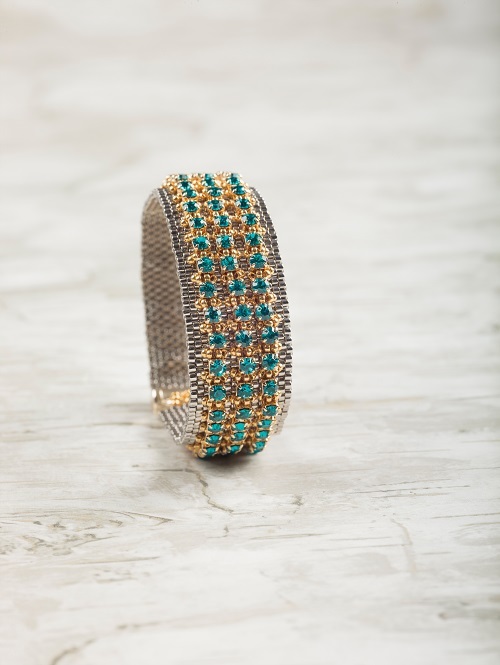 You have to look carefully to realize that it is not a hammered and embellished metallic cuff but one constructed from just seed beads! 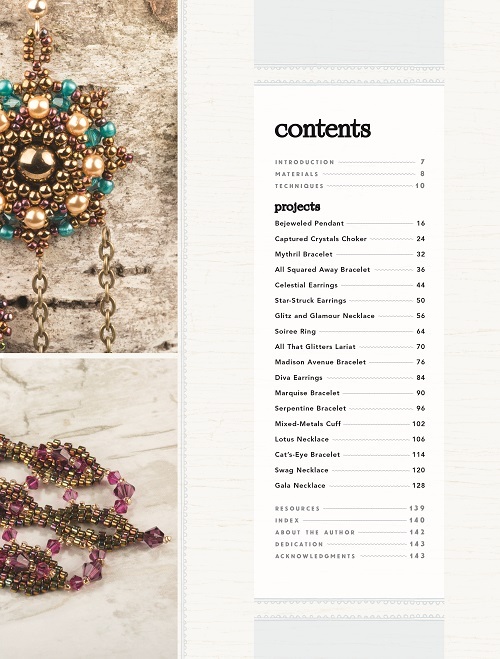 Definitely a book for beadwork lovers who like luxurious metallic designs! A good balance between very elaborate designs which will take a lot of time to complete with easier designs. please make a comment below. Make sure you leave contact info below if you do not have an online shop or blog. It ends in a week's time at 6 pm EST Monday, November 14, 2016. I will pick the winner randomly and announce the results as soon as possible after. So be sure to leave a contact email if you don't have an online link or make sure you come back and check! Otherwise I will redraw in a week. Good luck! Ooohhh! A lovely Christmas present for someone. Such gorgeous work! I am constantly inspired by the talents of others! Oohhh these are so gorgeous!! Love working with superduos and the like and I have quite a large stock of them to use-some spectacular designs like this would be great to utilise them. Blog follower, subscriber and Facebook fan, I can be contacted at retro-grrl@hotmail.com. stunning beadwork- would love to have. Blog follower. Oh MY, such stunning work. Deal me in. I'm a complete follower...twitter, FB, blog!!! OOOOooo I love the designs in this beautiful book! Crossing my fingers! What gorgeous designs! I can't imagine the work some of them take to create!! Such elegant designs. 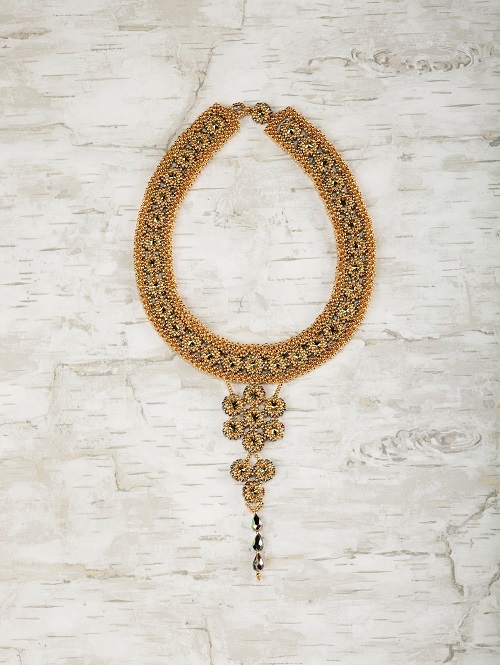 It is amazing what can be done with seed beads! What beautiful jewelry. Please add me to the list. I love working with beads and use them often in my kumihimo braids whether as an accent or the whole braid. And it goes without saying what they add to bead loom projects. I'm also a subscriber. Thanks again for providing such interesting and stimulating information. How very regal. To finish any one of these would be such an accomplishment. These pieces are ferociously awesome! I would love to add this to my library! This looks like an amazing book. I would love to have it as a resource in my library. I love seed beads! The Swag necklace looks very elegant. Thank you for this giveaway ! Kelly Wiese really does deliver on turning beads into great metal jewelry. I'd love to have this one. I'd love to win this book. Th swag necklace is gorgeous. Thank you for this giveaway. I'm a suscriber. I would love to win this book!!!! I am always looking for new ways to use my seeming endless abd growing seed bead supply!!!! All the pieces showing look gorgeous. Would be hard to decide what to make first. Love the designs and have learned most of the weaves. Now to use them on a beautiful project. thanks for sharing. Facebook follower. Fabulous designs, very creative. Would be very excited to win Kelly's beautiful book. Thank you Pearl for this opportunity. Awesome designs, truly great works of art. Love to include this book in my collection. Such opulent and luxurious designs. Fabulous inspiration. I have been wanting this book. Thanks for the opportunity to win it. Such Opulent designs! I love it! gorgeous designs and colors I do simple designs this would be awesome to learn. A Christmas gift for me I hope. Looks wonderful; cant wait to get going on some of these. I hope I win, If not I shall be buying or ask for a copy for Christmas. These projects look very special. Great talent. I would love to own this book thanks for the chance to win!